Alaskan humpback whales migrate to warm water locations for the winter where they mate, give birth and raise their young. Many migrate to the Hawaiian Islands and they start to arrive as early as November. The winter months are an intense, joyful time in Hawaii as we’re constantly bathed in the highly charged frequencies of these great friends of humanity. This winter was a season of CLOSE encounters between the whales and human beings. The whales chose to spend prolonged periods of time very close to tour boats. Some swimmers had up close and very personal experiences with humpbacks in our local bays. The humpback population has begun to recover thanks to the protection from the Marine Mammal Protection Act. Perhaps these close encounters reflect a new found trust in human beings and a desire to get to know us better! Helios, the avatar whale who is providing the transmissions on this page, is a cetacean I met years ago during one of my morning swims. He and another whale pulsed me with intense life force that refined my ability to receive the quality of downloads you’ll read on this page. He also reminded me of the purifying effects these great beings have on human beings. first posts on this page before reading this one. Today, April 26th 2015, I slipped into a local bay for my morning swim. Yes dolphins were swimming in the warm, clear waters. I decided to join them for a few minutes just to say hi and infuse myself with their joyful, loving presence. The water was crowded with excited swimmers who, for the most part, had never swum in the ocean with wild dolphins. My preference is to commune with my dolphin friends when there’s just a few swimmers helping themselves to the generous emanations from their heart centers. As I began my swim Helios connected with me telepathically and advised me fill every cell of my body with the indigo blue ray of Courage. I did so and thoroughly emptied myself of the fear based patterns I spent all night long clearing during my dreamtime. Helios advised me that I’d have an interesting cause and effect from charging myself up with Courage. I did my best to avoid contact with other human swimmers and observed the spinner dolphins gliding gracefully, many feet below the surface. I observed three, very active adolescents, playing vigorously with one another. I steer clear of that kind of activity. I don’t want to interfere with their playtime and I certainly don’t want to collide with these agile athletes of the sea. Suddenly, the three wild guys surrounded me and I felt a gentle nudge on my crown. One of those dolphins tapped my head with his tail!!! In all my years of sharing time and space with dolphins I’ve never been touched by a dolphin. Touching wild dolphins is strictly prohibited and dolphins rarely touch humans. When they initiate physical contact, it’s usually because they see a physical or energetic imbalance in the person. They connect physically to help the person clear the imbalance. Today, I assume I was blessed with help from a dolphin named Hara in completing a clearing process Helios describes in the transmission below. I’ve been suffering from exasperating sinus stuff for months. Perhaps this nudge from my cetacean friend was a contribution to my ultimate cure. I’ll let you know! Enjoy Helios’ transmission. He share’s some of my story as an example of the human condition. I encourage you to accept his offer for assistance. Today Kathryn gave herself her usual healing with one of the rays of Christ Consciousness. Today she was prompted, by me, to saturate every cell of her body with Courage. She needed to free herself of the impact of many lives lived in fear as a small child. During her dream time last night she reviewed several lifetimes when she met with complicated challenges as a young person. You all store fear in the chakra system. Each individual chakra interprets fear with a nuance that’s tinted by the filter of the chakra. If you experience pain or physical challenges in a part of your body, it may be due to contracted fear stored in that area of the body and the chakra that energizes that part of your physiology. Kathryn’s physical issues have been related to specific brow chakra imbalances. She’s dealt with physical pain in in the upper back, neck and head in the form of migraine headaches, cranial sacral issues as well as ear and tooth infections. Most recently she’s suffered from sinusitis. This was her incarnation to look, with a very clear lens, at the problems from her past that took away her motivation to listen to her guides and follow her guides’ advice concerning her purpose. This has been her lifetime to activate the frequency of Lotus that that deeply infuses the ray of Courage with enough God Presence to provide people with the strength to stand up for themselves. Lotus, like Courage, is a first chakra ray but it flows between the first chakra and the brow chakra or the sixth chakra. You’ll learn about Lotus in future posts. Kathryn has fully activated Lotus as she’s worked diligently on clearing fear for the past thirty years or so. Her physical afflictions have gradually cleared up. The most recent problem has been apparent sinus inflammation. Today, my spinner dolphin friend Hara assisted her in clearing the remaining sinus irritation. Hara swam close to her, flipped his tail and gently touched her crown. The frequency he pulsed into her crown was the Christ Consciousness ray of Courage. My spinner dolphin friends and I co-create service for people. You do not need to swim in our waters to receive our support in releasing troubling contracts that result in suffering through painful life experiences. We are here to help you to dissolve your contracts and re-write new one’s that serve you with love. Pulse your heart with Courage. Place your hand on your heart and ask your soul to send Courage through your hand into your heart. I am yours in Service. I am Helios. My body of wisdom holds all of the events that improve the heart’s ability to become more compassionate and transmutes these events into records. I pull excerpts from these records that I feel will lead you towards a far deeper understanding of what your heart and the hearts of all the dolphins and whales have in common. If you’re reading my transmission you know that there’s some mysterious forces at work that bring you strong impulses to look beyond the boundaries of conventional thought. And I do know you realize that there’s a Cetacean Nation here on Earth that’s here to help you develop your light body. During this month of April, I intend to bring you communications about my humpback nation and our friendship with Hawaii spinner dolphins. I’m doing so because I feel these transmissions will help you comprehend how remarkably compassionate our interspecies exchanges can be. We have our faults just like all of you do. My scribe is reflecting on our mating rituals which appear to be brutally abusive and certainly lacking in compassion. We’re also evolving and we’re gathering together to explore our complicated survival rituals and how they need to be changed to reflect our current circumstances. Thanks to the Marine Mammal Protection Act, we have countered the effects of being violently slaughtered by those who worked in the whaling industry. Our population levels keep rising. We’re no longer threatened by acts of violence from the human species. We do suffer from the effects of polluted oceans. However, we know there’s progress being made in purifying our waters. Compassionate exchanges between my humpback nation and our friends, the Hawaii spinner dolphins, are remarkable examples for the human beings who are also kind and compassionate. I serve you with these examples because I feel the veil of darkness, that’s defined your perceptions for so long, is beginning to lift. You are now more willing to prepare yourself for heightened awareness of the Golden Rule – Be kind to others as you would have others be kind to you. Dolphins and whales live here without the fetters of material life. When our basic needs for food and safety are met we have more time than you do for loving ourselves out of fear and learning from our guides. We came here to prepare the human species for mastering the demands of Earthly life. I now observe that some of you are welcoming the more refined spiritual concepts that the Cetacean Nation has always modeled for those who were perceptive enough to notice. You needed my rather lengthy introduction to my April series of posts on this website so you’re very clear about my mission as I share these transmissions with you. I evolve as you evolve. Our calling is one of the most complicated commitments any species of cetacean has made. We are here to interpret the fear generated by comrades of the sea and you - the human species. We have very deep friendships with the spinner dolphins who live in Hawaii’s coastal waters. Our special bond is reflected in the heart felt gratitude the spinners express when we arrive from our Alaskan home. The spinner dolphins are grateful for our commitment to their well-being. We serve them with healing of their fear. All mammals experience fear. Spinner dolphins hold the consciousness of the Golden Ground’s (Earth’s) human beings who look at life from different, sometimes conflicting perspectives. Spinner dolphins hold the frequency of Polarity. My humpback whales’ contribution to the spinner dolphins’ work is a very collaborative, cohesive, integrated sourcing of all that’s required for cetaceans and human beings to love one another through the sometimes paralyzingly complicated lessons. Our Golden Ground (Earth) counters every problem living, sentient beings have with one another’s perspectives. 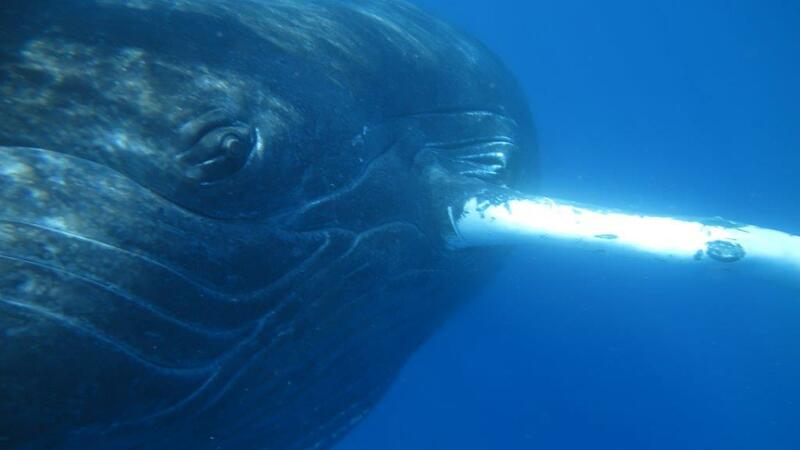 Humpback whales comprehend what it means to be courageous. Our ancestors were once hunted almost to extinction. There is a frequency of Christ Consciousness called Courage that we are currently helping the spinner dolphins merge with the Christ Consciousness ray of Polarity. If people and cetaceans flood their fields with the indigo blue ray of Courage, as they attempt to resolve conflicts with others, there’s an act of healing that takes place. I offer you a very short activation so you may experience the calming effect of Courage and the exhilarating effects of Polarity when you feel threatened. First saturate your entire body-mind-spirit with the indigo blue ray of Courage. Breathe Courage into your heart knowing it’s coming from your soul. Send that frequency of courage to every cell of your body and every aspect of your force field. Do the same with the deep aqua blue ray of Polarity. With practice you can activate yourself with these life giving energies in any contentious situation. Please use the comment area on the right side of this page. Let us know what you experience!